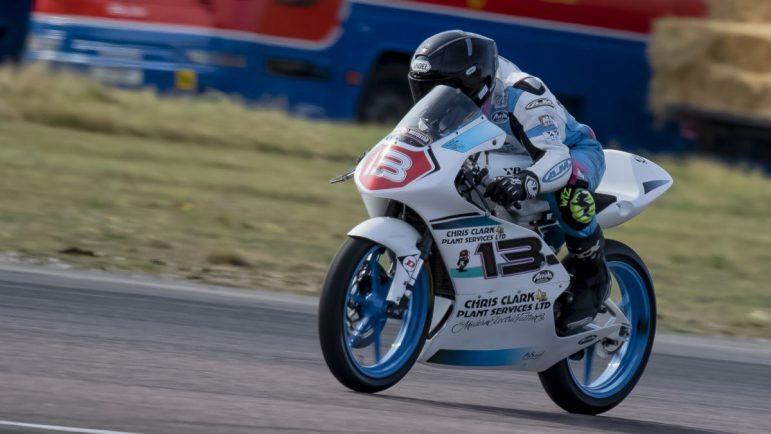 BROMSGROVE racer Jake Clark was back out on his Moto3 at the weekend for the fourth round of the Hel Performance British Motorstar Championship held at Thruxton. The 14-year-old was looking for some positives to take after the crash affected weekend at Brands Hatch in the previous round. In very hot conditions he made a successful start to the weekend. In the first free practice session he was 11th fastest, just a tenth outside the top ten. The hotter conditions in the afternoon didn’t enable Clark to improve on his morning’s time so he ended day one in the same position. The fantastic weather continued as the standard class Moto3 machines took to the 2.4-mile circuit for the 30-minute qualifying session. Clark continued to improve, shaving a second off his best lap time from free practice. The standard class is extremely competitive and despite his lap time of 1:25.447, he would line up 13th on the grid. After the start of the 12-lap race, Clark found himself behind the main group of riders. Although he was running the same pace he was unable to close up. In the final few laps he was battling with four other riders and crossed the line in 12th. The second race consisted of 14 laps of the Hampshire circuit. Overnight Clark and the team had decided to stiffen the suspension further and make other adjustments to suit him for race two. This time he was involved in a battle with Adi Behal. The two of them were swapping places throughout the race with Clark just losing out by 0.045 seconds at the line and finished 12th. Clark said: “In qualifying I got in with some of the quicker riders so I was trying to follow their lead. “However, I was struggling with the front end so after qualifying we stiffened the bike right up. “It was much bumpier here than last year. It was shaking my eyes out almost but the bike needed to be as stiff as it could be. “For race two we stiffened the bike more and changed some gearing.